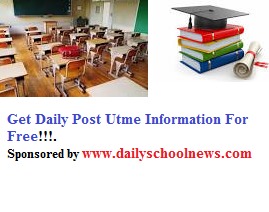 Breaking news reaching today, is that the University of Ilorin (popularly know as Unilorin) is inviting all candidates who have applied for admission into the Educational institution as First Choice either through UTME or Direct Entry, that they are expected to visit the University of Ilorin official website for step by step details and procedure for the Unilorin Pre- Admission Screening exercise. Candidates who choose the University of Ilorin as their Most Preferred Institution, should continue reading for more guidelines. For now, the academic institution is not accepting candidates who selected the institution as 2nd choice. Please, all candidates should note that Registration for the Pre-admission screening has already commenced, and will be closing on August 2019. The examination will be conducted using Computer Based Test (CBT) platform at Ilorin and Lagos Centres. Candidate must have scored a minimum of 180 marks in the just concluded 2019 UTME for all courses except those for which higher cutoff marks have been specified on the University website; Please check the UNILORIN Cut off Mark 2019 for further guidance. All applying candidates must have made the University of Ilorin their first choice either at UTME or Direct Entry (DE). All applying candidate must have obtained Five (5) Credits in relevant ‘O ’ Level subjects, at not more than two sittings except in MB; BS where only one sitting is acceptable. All eligible and qualified candidates should visit the University website www.unilorin.edu.ng to complete their registration online. Please, we advise you to visit the website directly, because assessing the above Unilorin website through any search engines may lead to redirection to other websites which are not associated with the University of Ilorin. For further inquiries on how to register or other issues, we advise all candidates that they should not hesitate to contact the University to help through their email address. Further details on the Unilorin registration guidelines are available on the University website http://www.unilorin.edu.ng. Please note that candidates for the pre-admission screening exercise are advised to be decently dressed to avoid embarrassment. All applying candidates who are indecently dressed will not be allowed into the screening premises, this includes both the male and female student. Please also note that Phones and all other forms of mobile communication, electronic devices, bags, and luggage are not allowed within the screening premises. Hope you are also informed that ONLY registered candidates for the screening exercise will be allowed into the screening premises, so please do commence your registration now. Please note that accommodation is available for Pre Admission screening candidates at the rate of N1,000.00 or N3,000.00 per night in Unilorin. The school is also trying to produce more building for her growing number of students. The school executives are also putting a plan together to build 1,675 Room Hostels. Please share this information with your friends on Google+, facebook, and twitter using the share buttons below. Hello King, this is due to the fact that the school is having database congestion, due to too many requests from other candidates who are also trying to register. Please exercise patient while the school technical team try resolving this issue. Godluck King with your registration. Nice ideal Emmanuel Stephen, due to the fact that this is among the first choice of students round the country, the school should probably create more agencies/agents in popular states in Nigeria. You should use Google Map, this is your best bet to ensuring, that you get to your location. Use the guidelines shared above Sulaiman. Plssss, wen will d screening form be awt? Nd I scored 190 nd go for edu course, m I gewd to go? Hello Ifeolu, surely you’re in luck. But you should know that the University of Ilorin has thousands of candidates seeking for admission, so 190 may be good for Edu courses, but remember that those who scored above 200, might be given admission, but pushed to other courses. Goodluck. The application date is closed. Sorry Tosin. But you need to wait till the 2017 batch is open. Which means you need to re-register for the 2017 jamb cbt examination. Please when’s the unilorin’s screening commencing for 2016?? It is due to several/thousands of other candidates trying to access this portal with you. Wait a little and keep on trying. Their form is already Out, Zikrah. Go get the Unilorin post UTME form before it’s too late. Pls I scored 190 in jamb and I want to study criminology can I be given admission? Yes. Depends totally on your POST UTME scores.